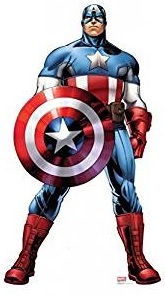 Since he first appeared in 1940 on a cover depicting him punching Hitler in the face and wearing a costume strongly based on the Stars and Stripes, Captain America has occupied a special place in the hearts of American comic book fans, one that has not only endured nearly eight decades but actually grown stronger over time, culminating in his appearance in several big budget and highly successful films. Well known for his rigid moral code and unwavering loyalty to his country, which he defends from all threats, those without and those within(so watch out all you secret corrupt government organizations, the Captain will stop you) he has a strong sense of right and wrong, the patriotic Captain America has always his powers and abilities for good no matter what the consequences which why he is the leader of Earth’s mightiest heroes the Avengers. Along with Ant Man, the Hulk, Wasp, Thor and Iron Man, Captain America who was retrospectively granted founding member status helped form the Avengers, a group of Earth’s mightiest heroes. 1 What are Captain America’s super powers? 2 How did Captain America get his Powers? What are Captain America’s super powers? While he is one of the most respected Superheroes on Earth, that is due to his impressive leadership and sense of duty, for although he is a superhuman he is not super powerful, with many other superheroes ranking well above him in sheer power levels. All this begs the question what are Captain America’s super powers? Well the answer is he possesses enhanced strength, durability, agility and reflexes. These powers make him a fearsome close combatant. Truthfully it’s not Captain America’s super powers that make him one of the best, it’s Steve Roger’s skills and abilities some of which are innate and others are the result of rigorous training which make him among the best. We’ve made a small list of the attributes that set him apart from the rest of the superhero community. He has received intensive military close combat and firearm training as befitting his status as the world’s first Avenger, this training was superior to even what other special forces were receiving and made all the more effective given his new found powers(it should be noted that Cap is too nice to shoot you these days, he’ll just beat you unconscious instead)this makes him a brutally effective combatant. He is unparalleled strategist, intuitively sensing the weaknesses of his opponents and how best to utilize not only himself but also any available resources or team members, this brilliant leadership is most likely the result of both an innate natural ability combined and enhanced by intensive military training and refined from decades on the battlefield making him one of the most effective superhero leaders in the world. 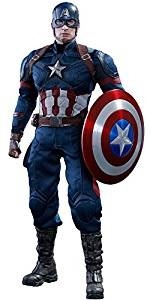 He was issued with a nearly indestructible circular shield made from Vibranium, originally given to him as source of personal protection, no one could have predicted the results of Captain America’s new powers, which combined with Steve Roger’s ingenuity, turned this useful defensive shield into a powerful ranged offensive weapon which his enemies have come to fear time and again. 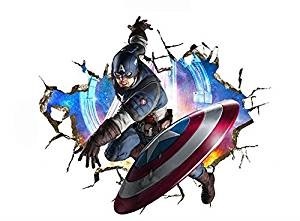 Captain America can throw his shield with uncanny accuracy often with a return trajectory(apparently Vibranium is very bouncy) so he can recover his weapon, opponents struck with shield can suffer serious injuries(unless they themselves are superhumanly durable)due to the shield being thrown at high velocities because of the Captain’s strength. How did Captain America get his Powers? Now that we know what he can do, the next logical question is how did Captain America get his powers? And the answer to that lies in his World War 2 origins in which he was one of world’s first super soldiers fighting along side Bucky Barnes(who would become the winter soldier) and even Wolverine once(although at the time he didn’t know he was mutant with near unlimited regenerative powers, nope he just thought he was really lucky and so they just called him lucky James). It was the German scientist Dr Eskine who approached the United States government with an offer to help develop a super soldier, this he did in protest to the actions of the Nazi party of his German homeland. The American government readily accepted because although they were not yet involved in the escalating conflict some in the military suspected that they would soon be caught up in the conflict. The method to produce the perfect soldier that Dr Erskine developed was a super soldier serum which would require both oral and intravenous treatments, all that remained was selecting a test subject, and despite the government providing several suitable candidates, Dr Eskine choose Steve Roger’s after seeing the frail youth attempting to join the army despite his obviously weak body and defective heart condition, impressed with both Steve’s determination and sense of duty and patriotism. Steve readily accepted the Doctors offer and underwent the procedure, which was a success. Unfortunately after the process, a German Hydra operative infiltrated the secret project and assassinated Dr Eskine(who had refused to commit the entire formula for the super soldier serum to paper) this left Steve Rogers as unique government operative, and then later on, a one of a kind superhero. Although not the most powerful superhero he remains one of our all time favourites, and we wanted to know more about the Marvel Universes Captain America, and so we found this great you Tube clip. Enjoy. We here at Superheroes Central love Cap, and if you do too and want to find out about Captain America’s original story the click here. In the comics it was established the shield was an alloy of vibranium, adamantium, and good ol’ American steel. This is from multiple sources, including Cap’s Marvel Knights series, referencing a “metallurgical accident” which could not be replicated. Just FYI.